While in Beirut to attend a glamorous banquet, legendary French actress Catherine Deneuve (Potiche, Belle de Jour) insists on being taken to the southern regions of Lebanon in order to see first-hand the devastation caused by Israel's month-long bombing campaign there in the summer of 2006. Cleverly blurring the lines between documentary and fiction, directors Khalil Joreige and Joana Hadjithomas (A Perfect Day) create a mesmerizing, thought-provoking travelogue in which they appear as filmmakers capturing Deneuve's road-trip on camera. 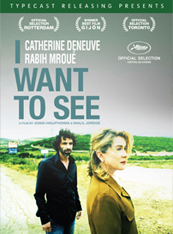 After visiting the crumbling ruins of ancient villages and watching as the shattered remnants of cities and towns are slowly pushed into the sea, Deneuve's perception of Lebanon is transformed somewhat when she appears later that evening before the myriad photographers ardently capturing her image at the elegant evening gala.